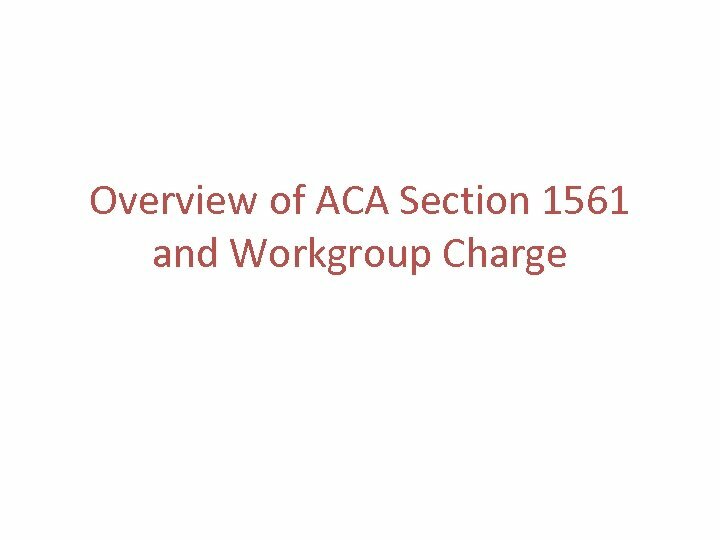 Section 1561 of Affordable Care Act • § 1561. 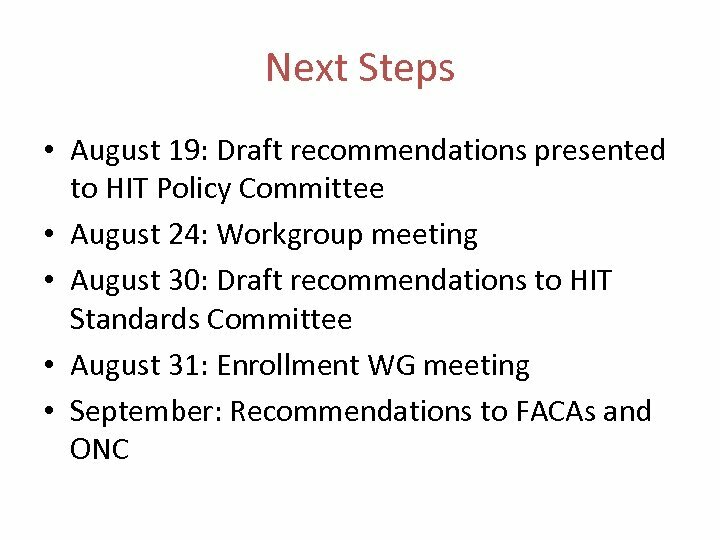 HIT Enrollment, Standards and Protocols. 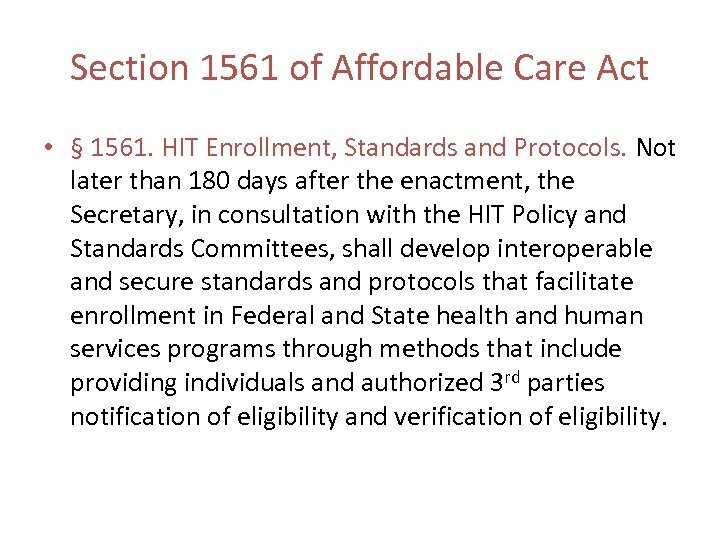 Not later than 180 days after the enactment, the Secretary, in consultation with the HIT Policy and Standards Committees, shall develop interoperable and secure standards and protocols that facilitate enrollment in Federal and State health and human services programs through methods that include providing individuals and authorized 3 rd parties notification of eligibility and verification of eligibility. 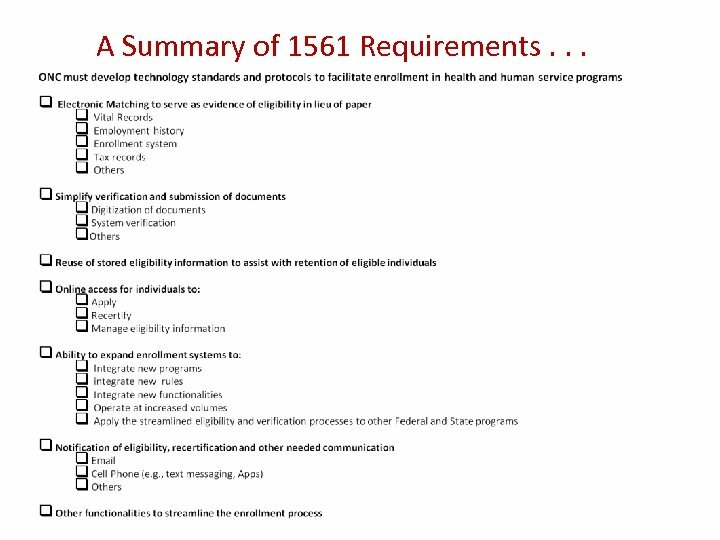 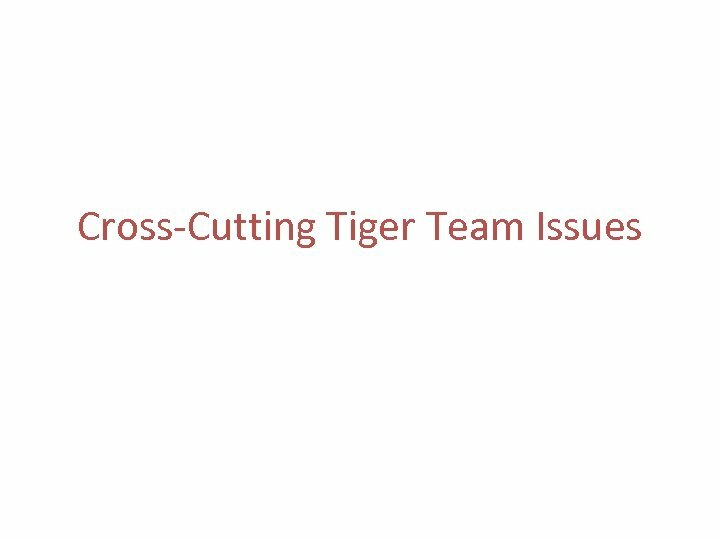 A Summary of 1561 Requirements. 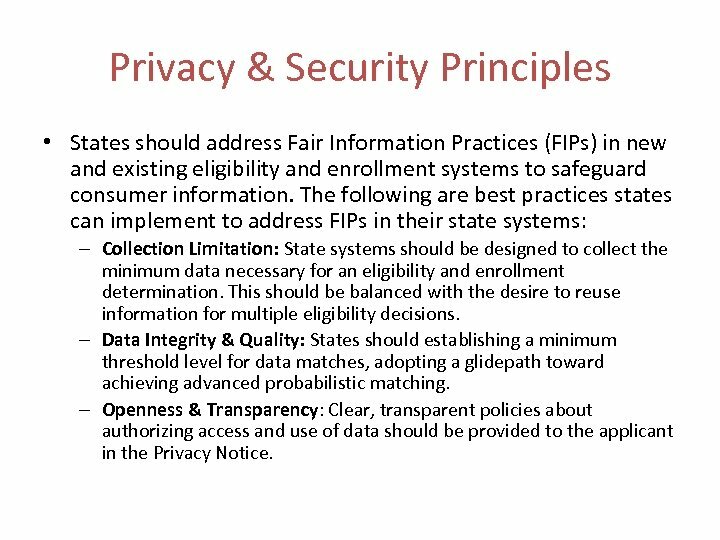 . .
Privacy & Security Principles • States should address Fair Information Practices (FIPs) in new and existing eligibility and enrollment systems to safeguard consumer information. 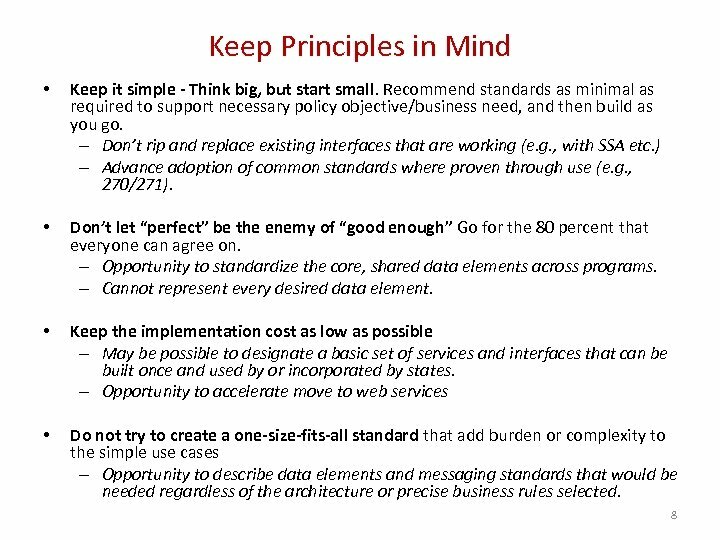 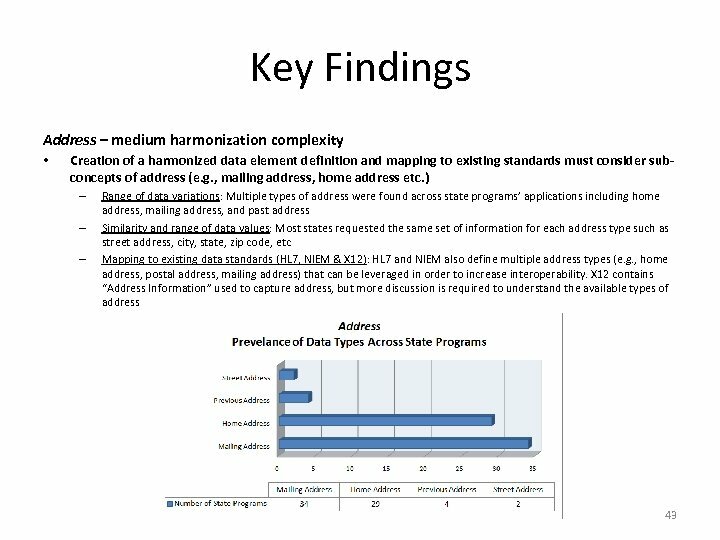 The following are best practices states can implement to address FIPs in their state systems: – Collection Limitation: State systems should be designed to collect the minimum data necessary for an eligibility and enrollment determination. 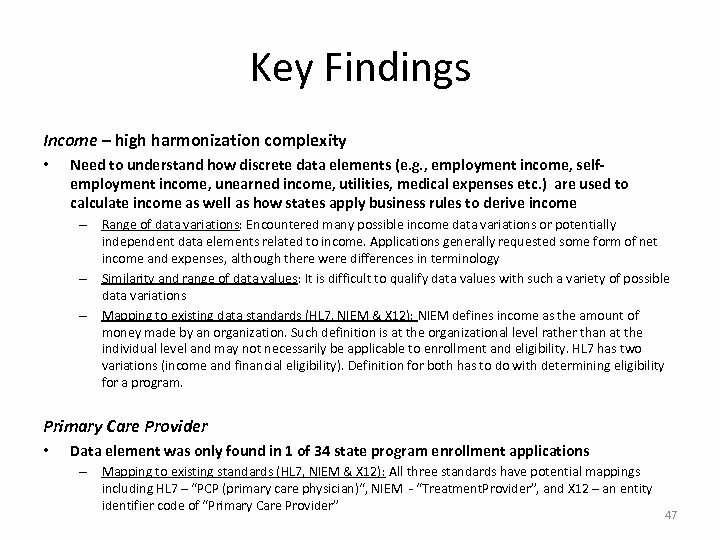 This should be balanced with the desire to reuse information for multiple eligibility decisions. 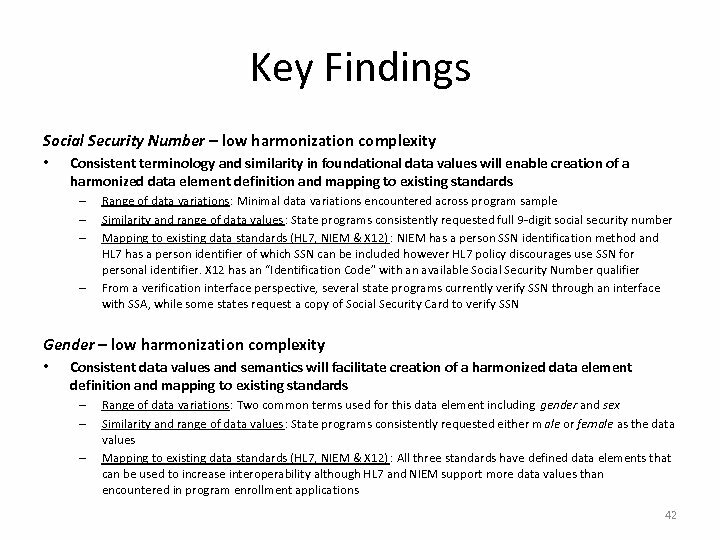 – Data Integrity & Quality: States should establishing a minimum threshold level for data matches, adopting a glidepath toward achieving advanced probabilistic matching. 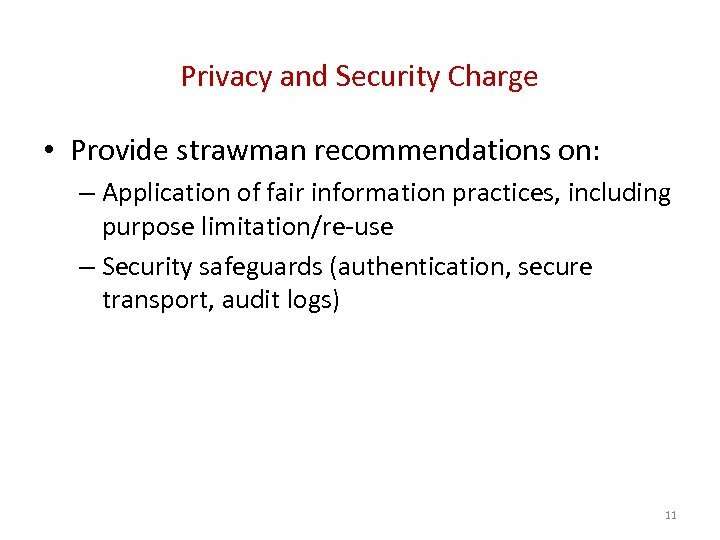 – Openness & Transparency: Clear, transparent policies about authorizing access and use of data should be provided to the applicant in the Privacy Notice. 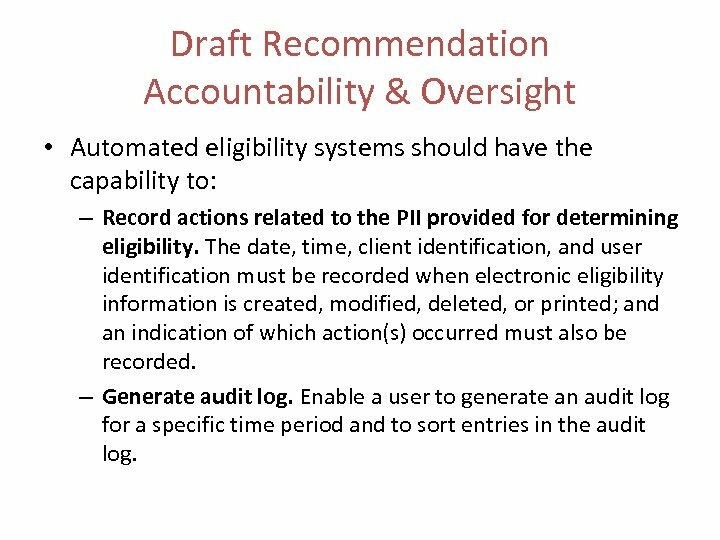 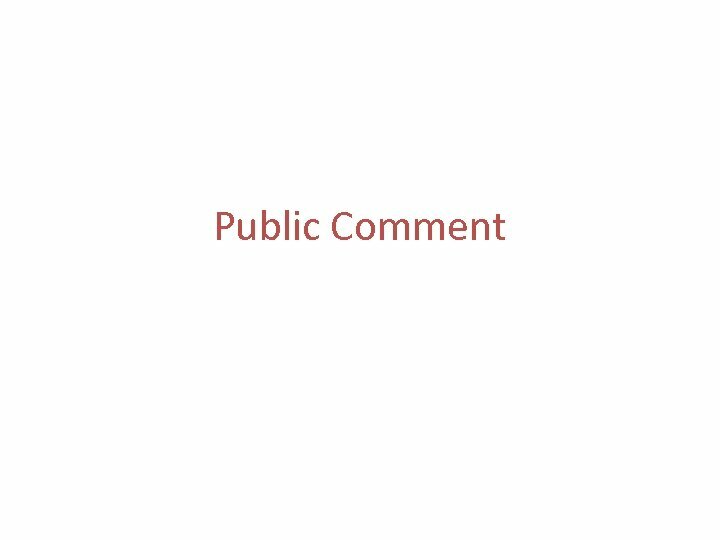 Draft Recommendation Accountability & Oversight • Automated eligibility systems should have the capability to: – Record actions related to the PII provided for determining eligibility. 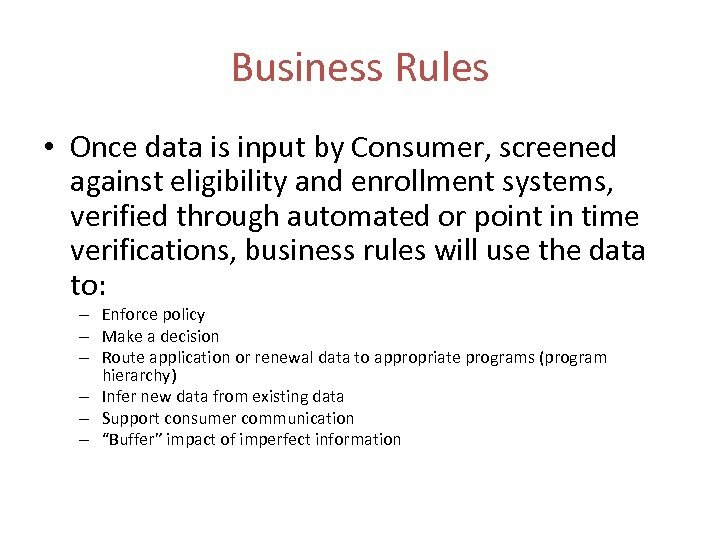 The date, time, client identification, and user identification must be recorded when electronic eligibility information is created, modified, deleted, or printed; and an indication of which action(s) occurred must also be recorded. 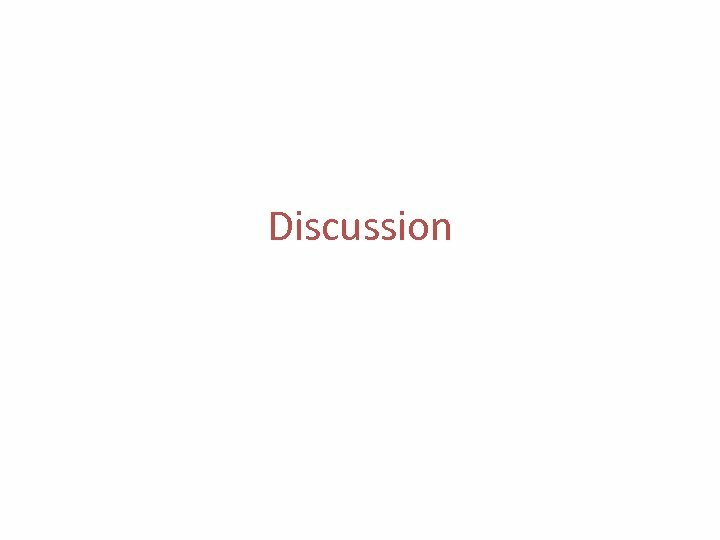 – Generate audit log. 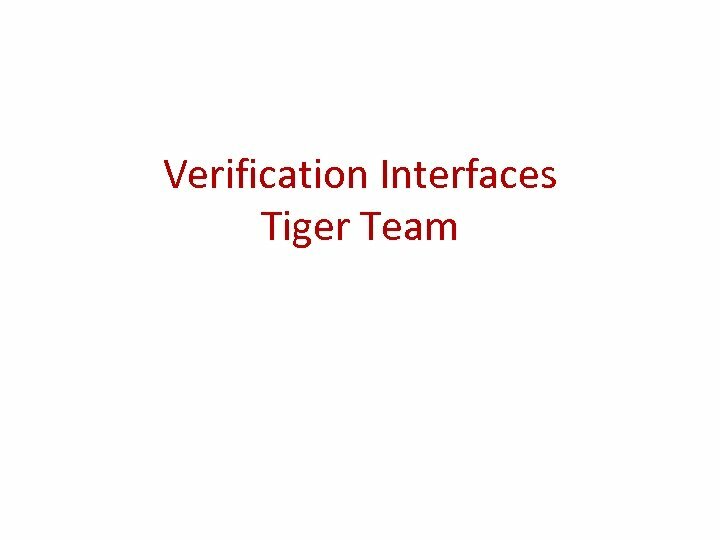 Enable a user to generate an audit log for a specific time period and to sort entries in the audit log. 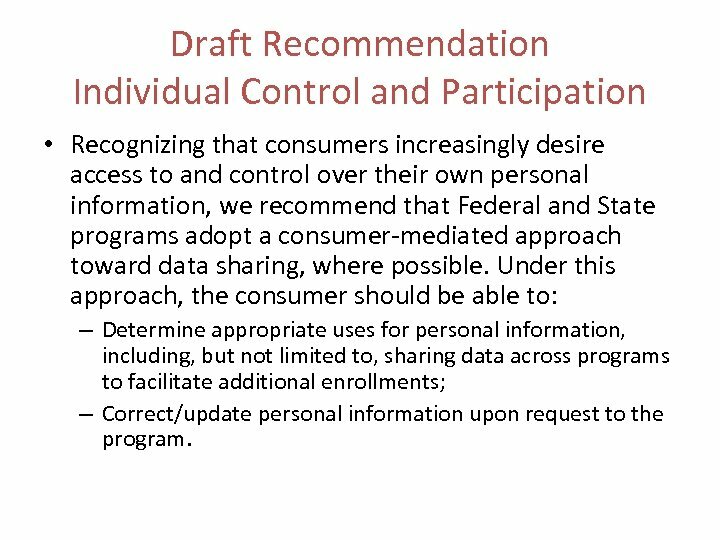 Draft Recommendation Individual Control and Participation • Recognizing that consumers increasingly desire access to and control over their own personal information, we recommend that Federal and State programs adopt a consumer-mediated approach toward data sharing, where possible. 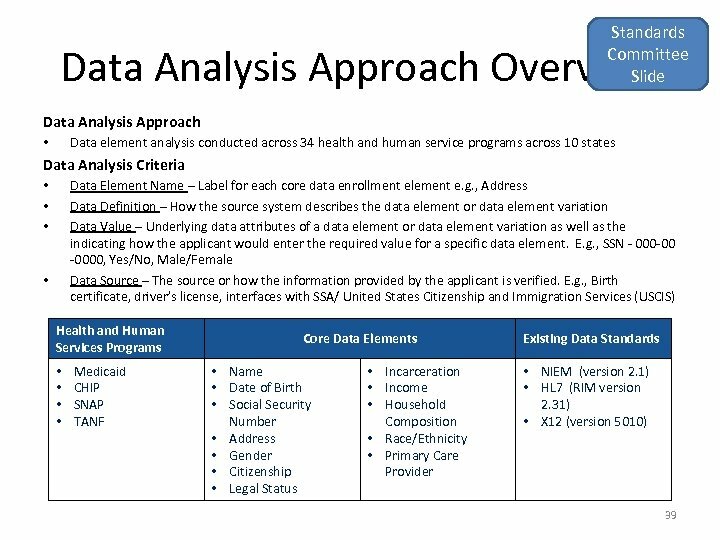 Under this approach, the consumer should be able to: – Determine appropriate uses for personal information, including, but not limited to, sharing data across programs to facilitate additional enrollments; – Correct/update personal information upon request to the program. 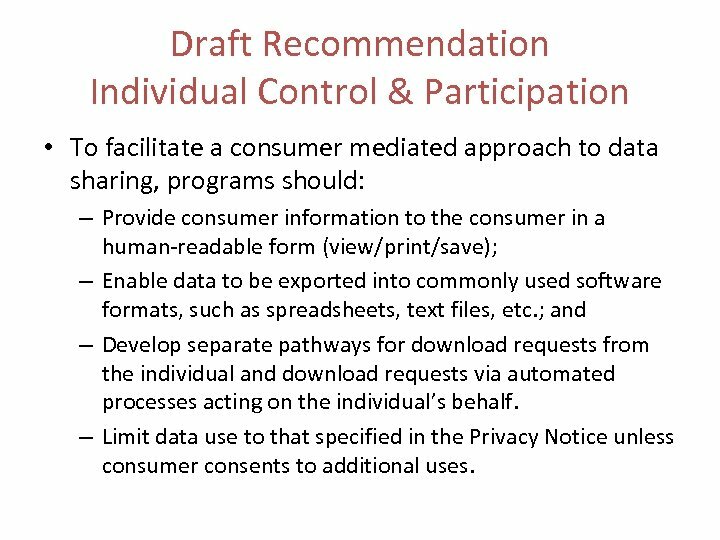 Draft Recommendation Individual Control & Participation • To facilitate a consumer mediated approach to data sharing, programs should: – Provide consumer information to the consumer in a human-readable form (view/print/save); – Enable data to be exported into commonly used software formats, such as spreadsheets, text files, etc. 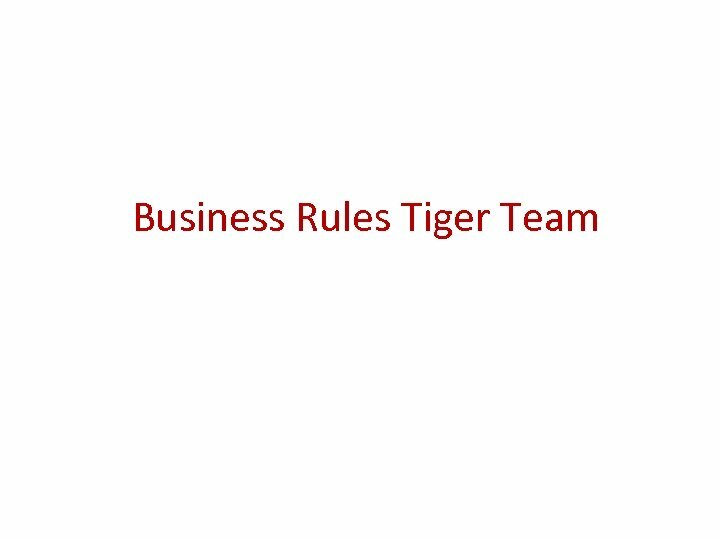 ; and – Develop separate pathways for download requests from the individual and download requests via automated processes acting on the individual’s behalf. 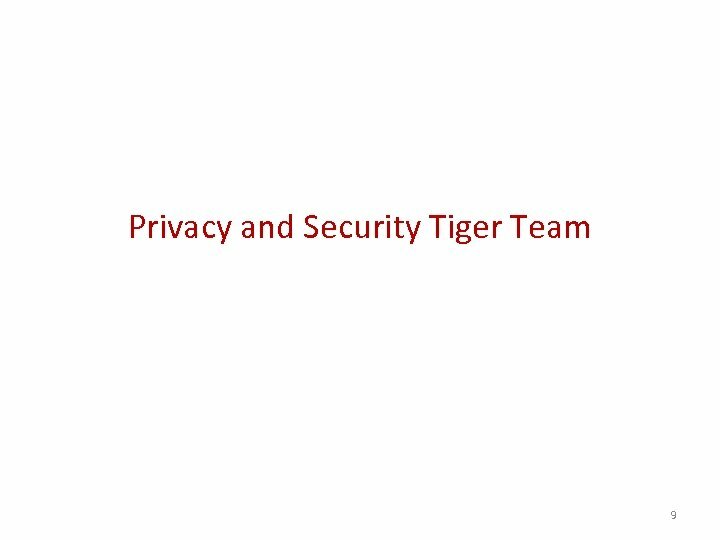 – Limit data use to that specified in the Privacy Notice unless consumer consents to additional uses. 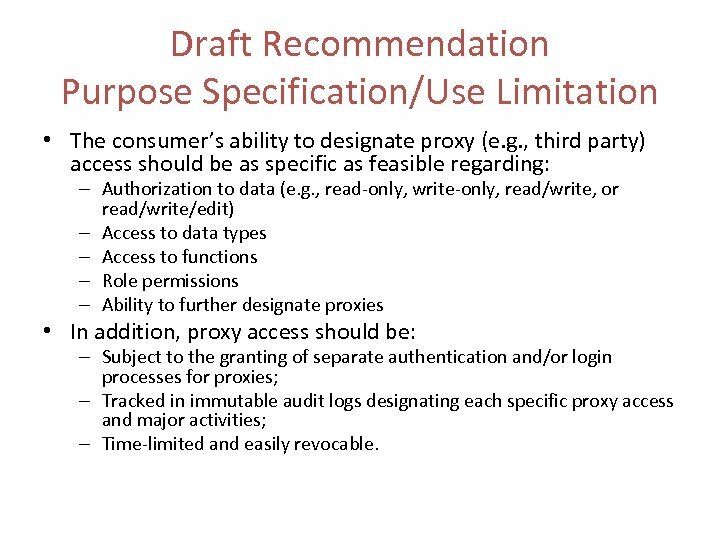 Draft Recommendation Purpose Specification/Use Limitation • Consistent with the Privacy Act, the Privacy Notice provided to the consumer during the application process will govern the consumer’s rights to confidentiality and privacy. 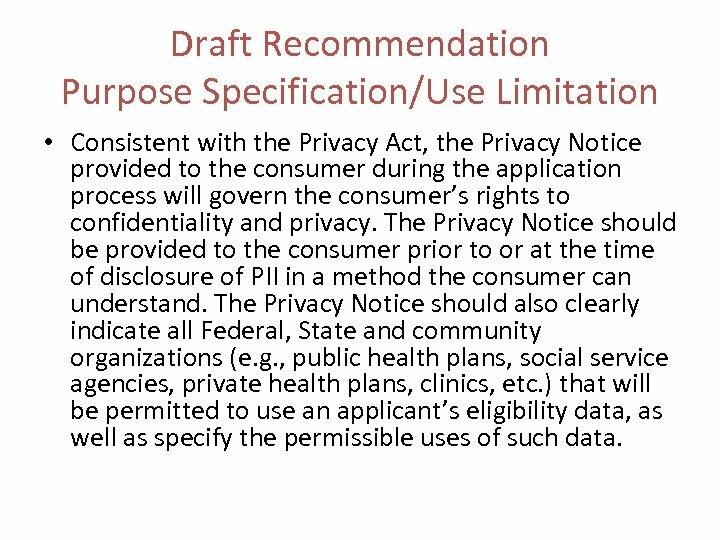 The Privacy Notice should be provided to the consumer prior to or at the time of disclosure of PII in a method the consumer can understand. 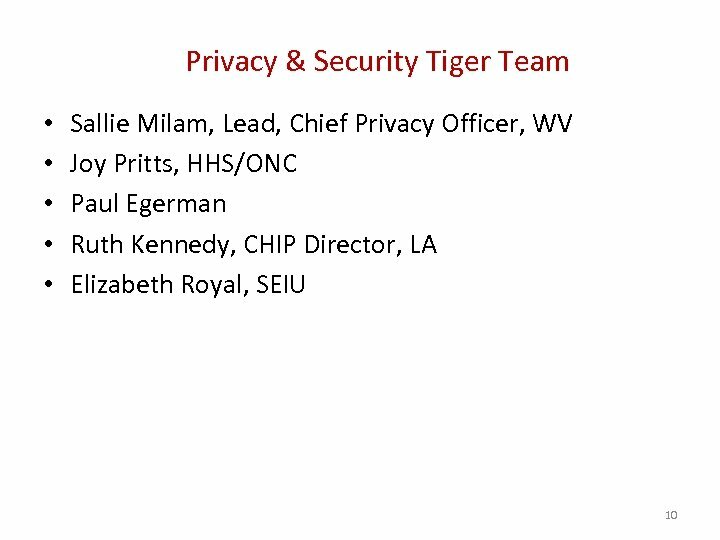 The Privacy Notice should also clearly indicate all Federal, State and community organizations (e. g. , public health plans, social service agencies, private health plans, clinics, etc. ) 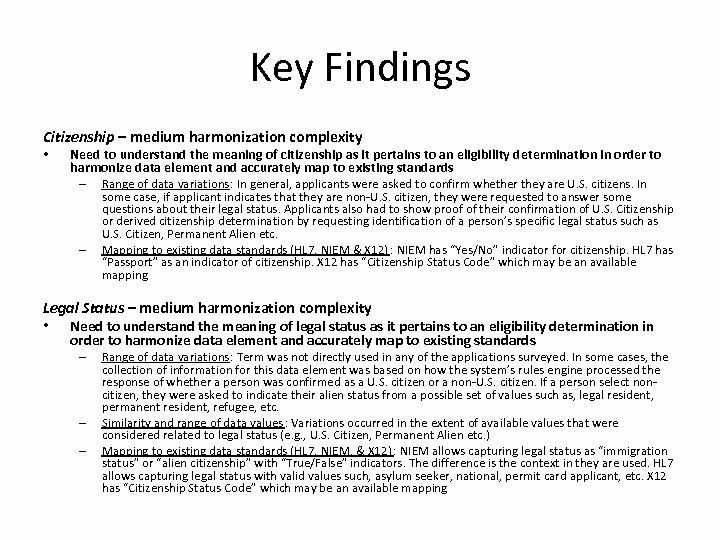 that will be permitted to use an applicant’s eligibility data, as well as specify the permissible uses of such data. 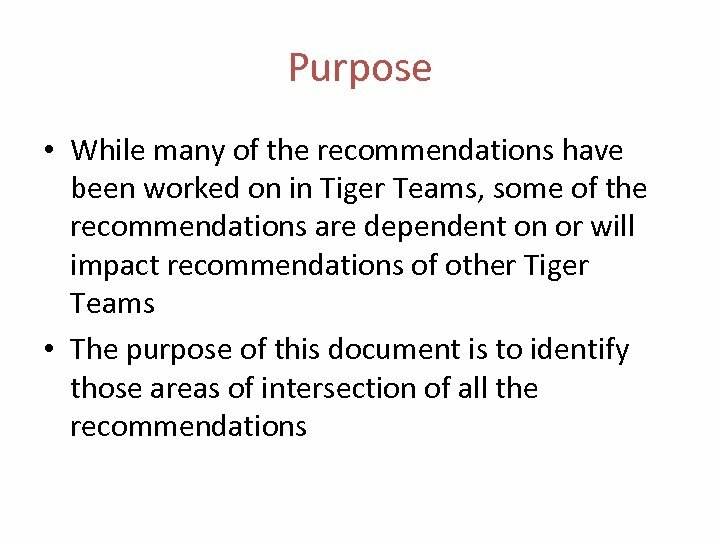 Draft Recommendation Purpose Specification/Use Limitation • The consumer’s ability to designate proxy (e. g. , third party) access should be as specific as feasible regarding: – Authorization to data (e. g. , read-only, write-only, read/write, or read/write/edit) – Access to data types – Access to functions – Role permissions – Ability to further designate proxies • In addition, proxy access should be: – Subject to the granting of separate authentication and/or login processes for proxies; – Tracked in immutable audit logs designating each specific proxy access and major activities; – Time-limited and easily revocable. 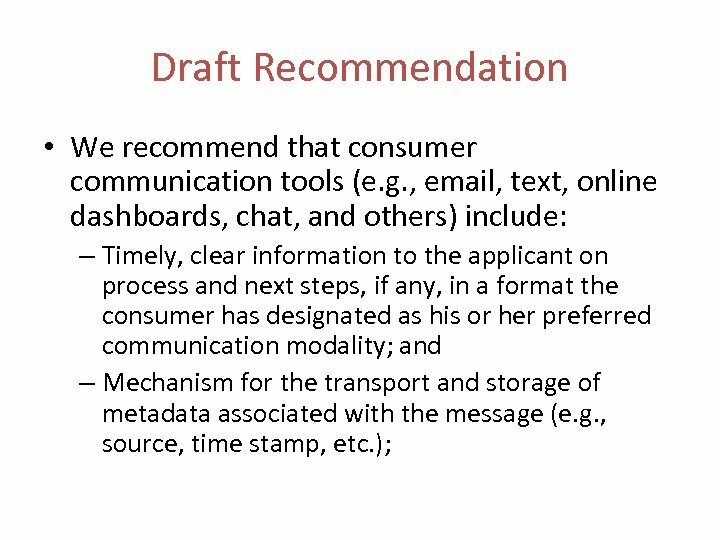 Draft Recommendation Security Safeguards – Secure Transport • We recommend that data in motion be encrypted. 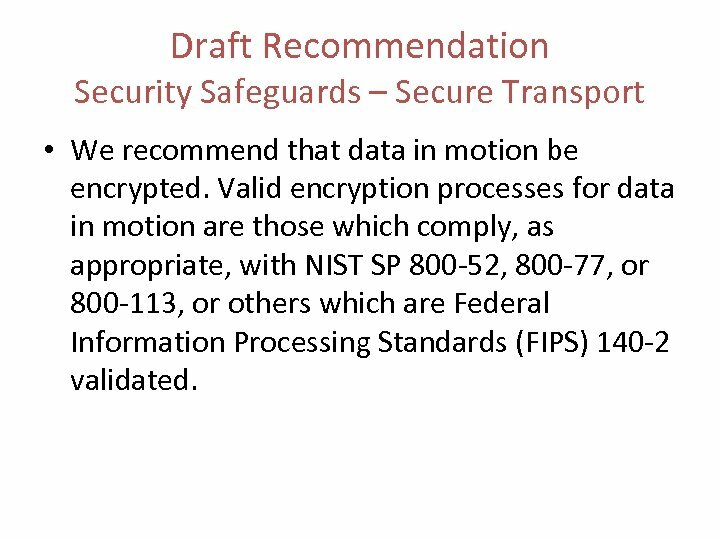 Valid encryption processes for data in motion are those which comply, as appropriate, with NIST SP 800 -52, 800 -77, or 800 -113, or others which are Federal Information Processing Standards (FIPS) 140 -2 validated. 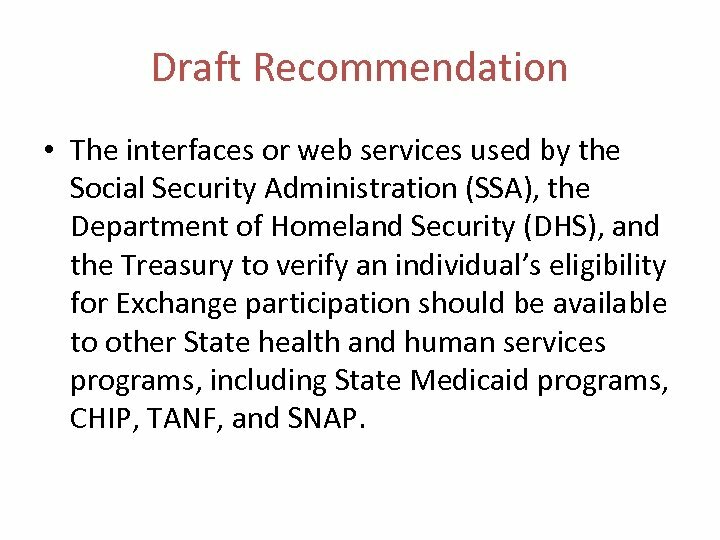 Draft Recommendation • The interfaces or web services used by the Social Security Administration (SSA), the Department of Homeland Security (DHS), and the Treasury to verify an individual’s eligibility for Exchange participation should be available to other State health and human services programs, including State Medicaid programs, CHIP, TANF, and SNAP. 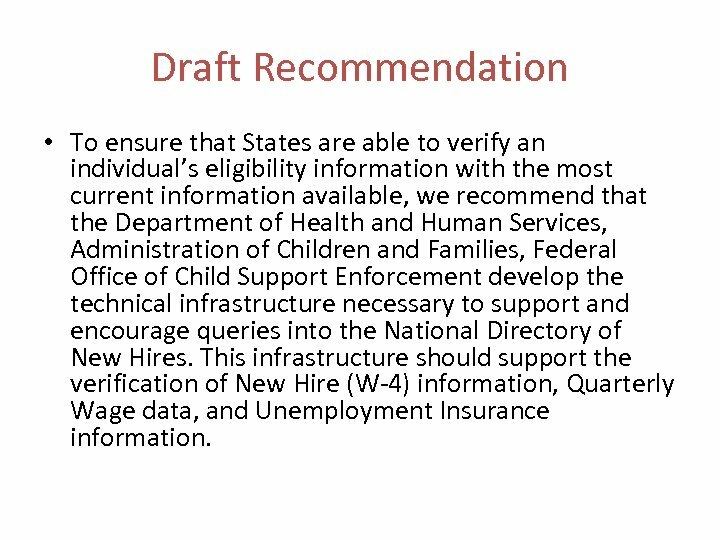 Draft Recommendation • To ensure that States are able to verify an individual’s eligibility information with the most current information available, we recommend that the Department of Health and Human Services, Administration of Children and Families, Federal Office of Child Support Enforcement develop the technical infrastructure necessary to support and encourage queries into the National Directory of New Hires. 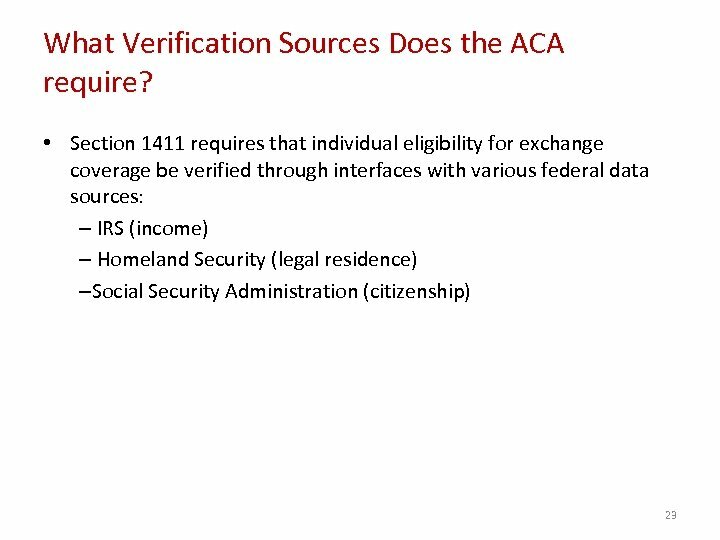 This infrastructure should support the verification of New Hire (W-4) information, Quarterly Wage data, and Unemployment Insurance information. 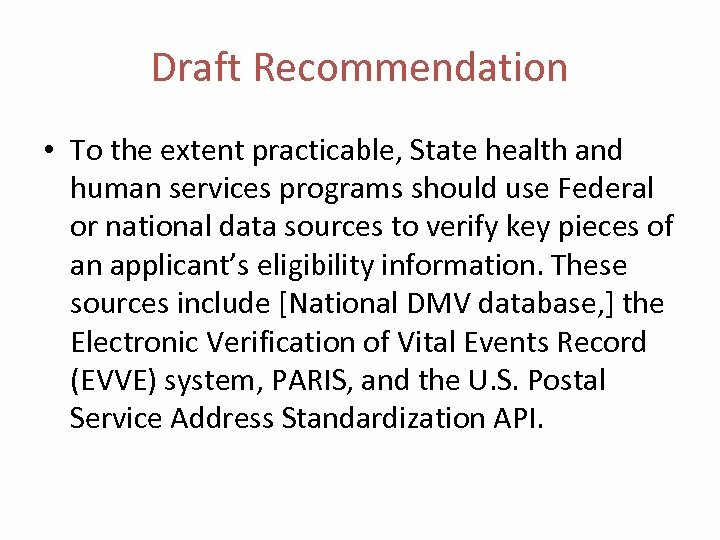 Draft Recommendation • To the extent practicable, State health and human services programs should use Federal or national data sources to verify key pieces of an applicant’s eligibility information. 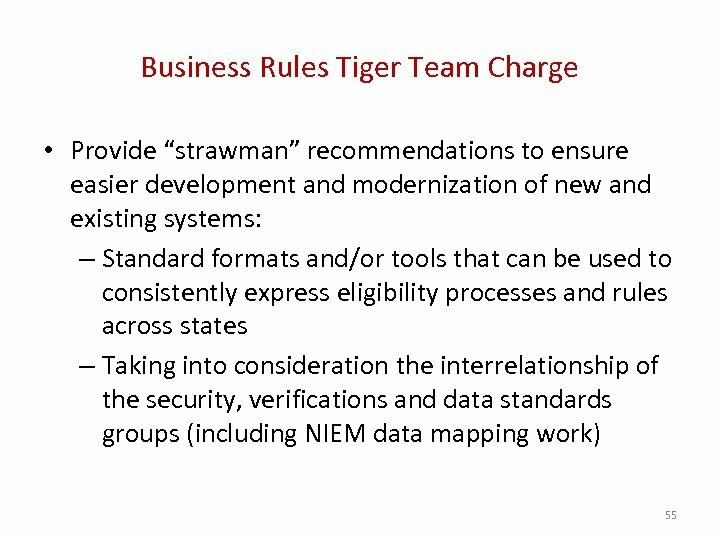 These sources include [National DMV database, ] the Electronic Verification of Vital Events Record (EVVE) system, PARIS, and the U. S. Postal Service Address Standardization API. 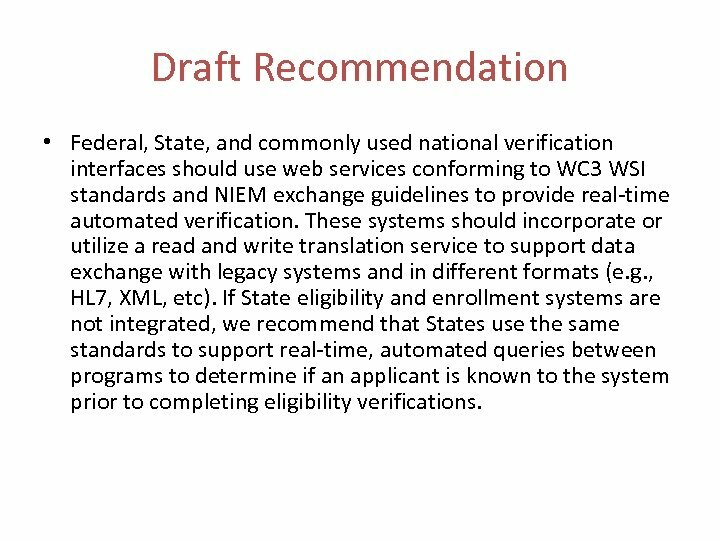 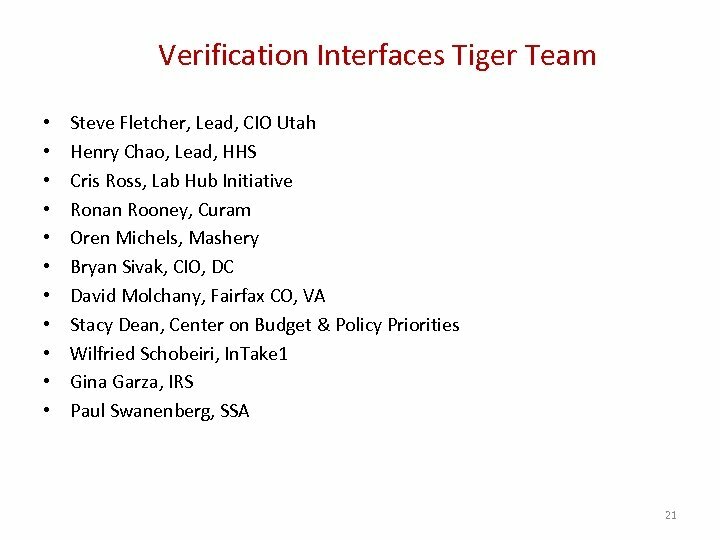 Draft Recommendation • Federal, State, and commonly used national verification interfaces should use web services conforming to WC 3 WSI standards and NIEM exchange guidelines to provide real-time automated verification. 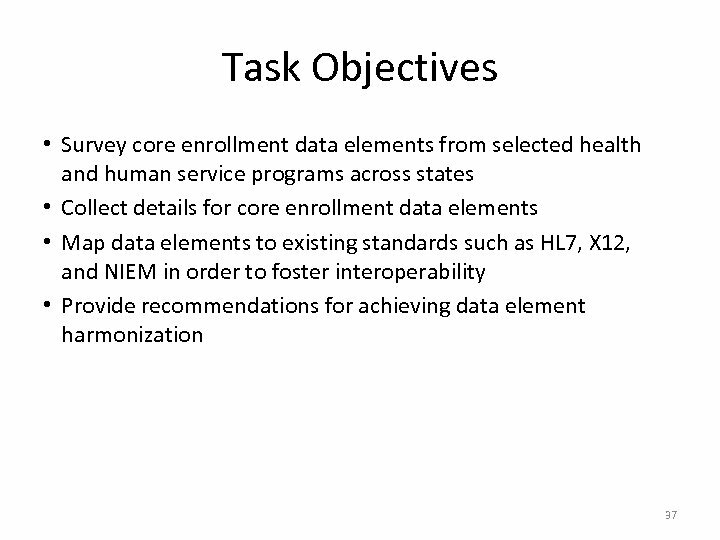 These systems should incorporate or utilize a read and write translation service to support data exchange with legacy systems and in different formats (e. g. , HL 7, XML, etc). 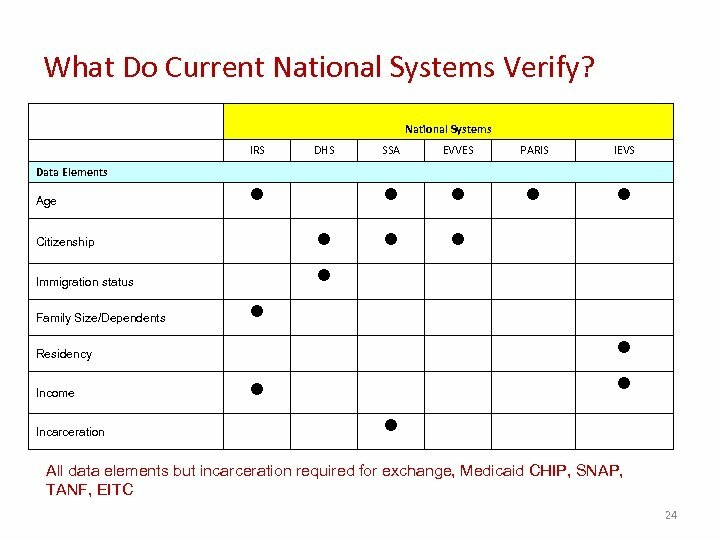 If State eligibility and enrollment systems are not integrated, we recommend that States use the same standards to support real-time, automated queries between programs to determine if an applicant is known to the system prior to completing eligibility verifications. 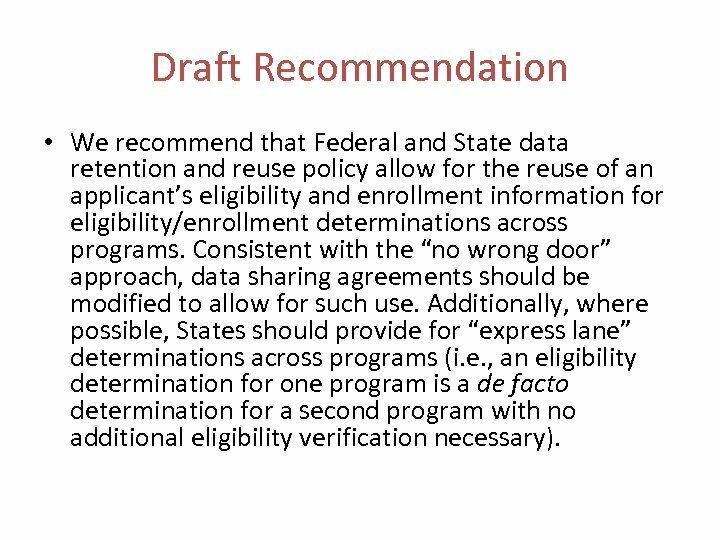 Draft Recommendation • We recommend that Federal and State data retention and reuse policy allow for the reuse of an applicant’s eligibility and enrollment information for eligibility/enrollment determinations across programs. 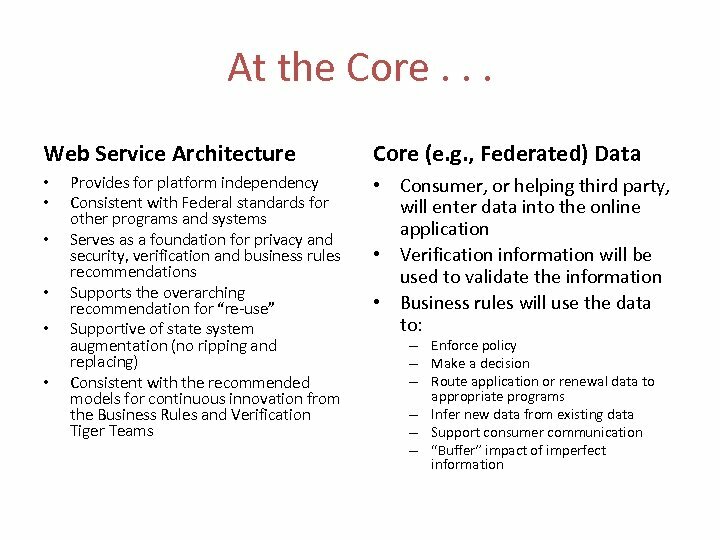 Consistent with the “no wrong door” approach, data sharing agreements should be modified to allow for such use. 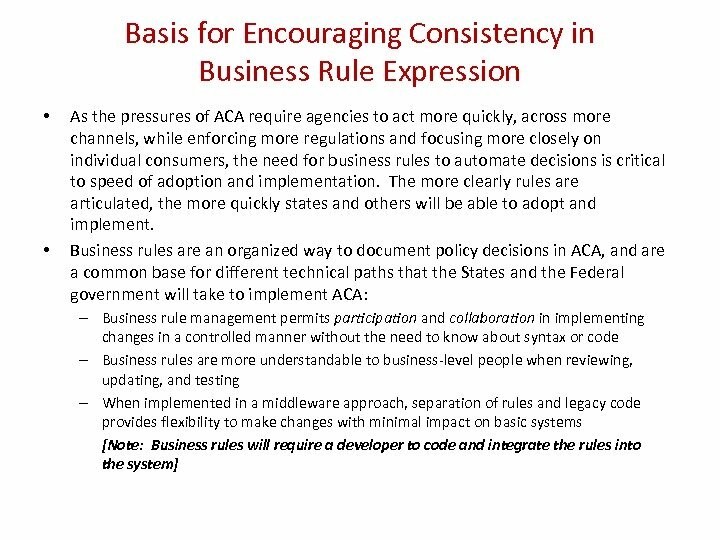 Additionally, where possible, States should provide for “express lane” determinations across programs (i. e. , an eligibility determination for one program is a de facto determination for a second program with no additional eligibility verification necessary). 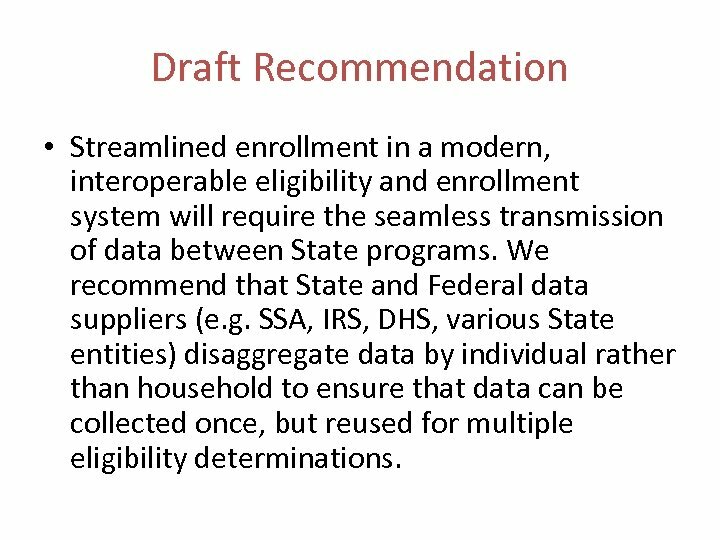 Draft Recommendation • Streamlined enrollment in a modern, interoperable eligibility and enrollment system will require the seamless transmission of data between State programs. 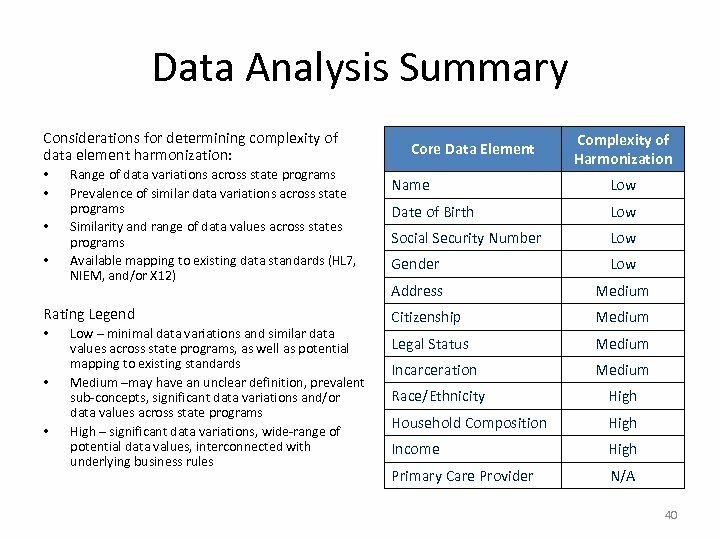 We recommend that State and Federal data suppliers (e. g. SSA, IRS, DHS, various State entities) disaggregate data by individual rather than household to ensure that data can be collected once, but reused for multiple eligibility determinations. 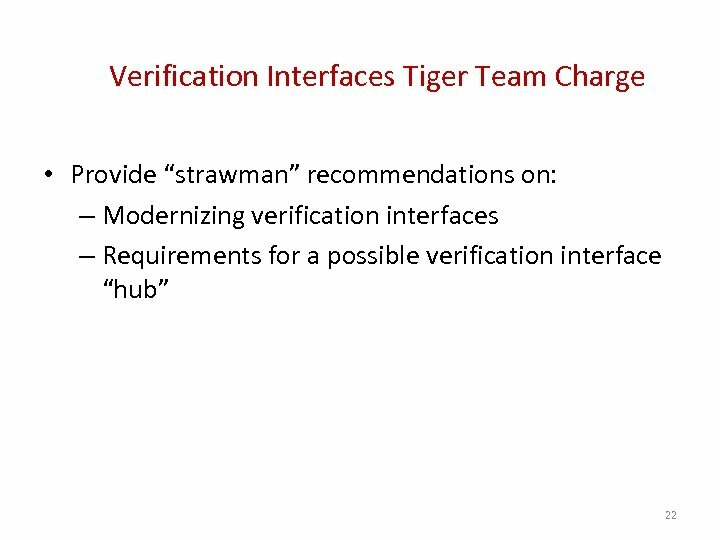 Draft Recommendation • Verification protocols should support both automated and point-in-time verifications. 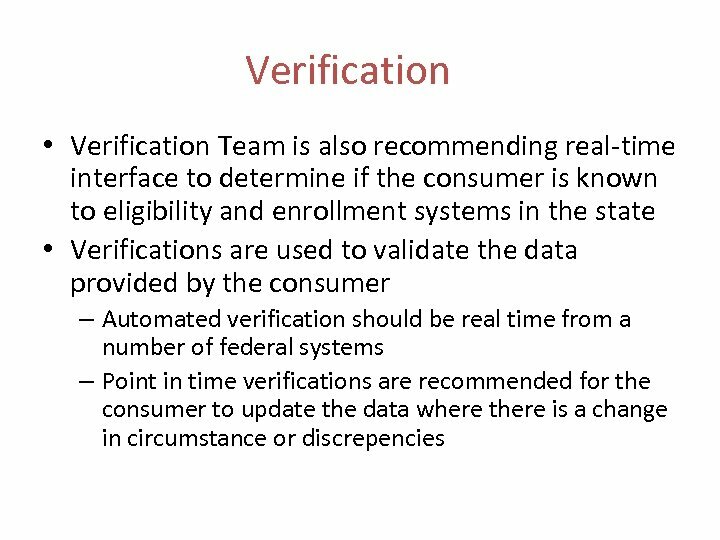 We recommend that Federal and State agencies implement the following best practices for both automated and point-in-time verifications to preserve data quality and integrity: – Consistent method for transmitting necessary metadata (e. g. , source, time stamp, date last modified, etc. ) 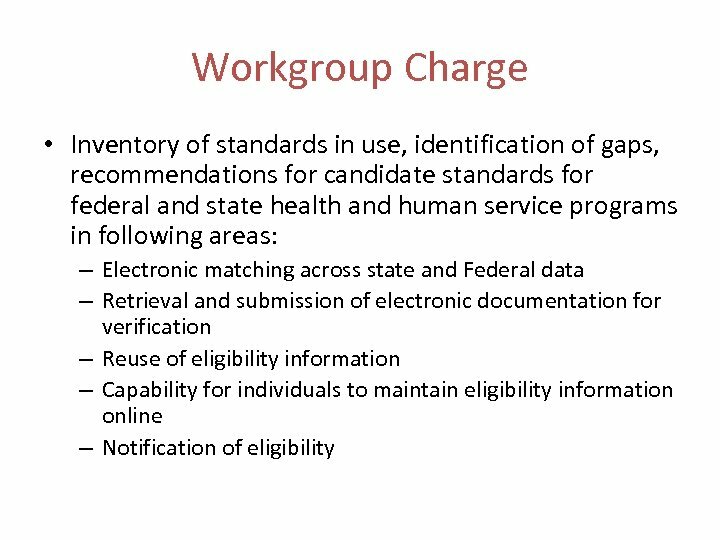 with eligibility and enrollment information when exchanging information between programs; – Storing raw data with derived data when using a formulaic calculation for any data element upon which an eligibility determination will be made (e. g. , income); – Use of Dublin Core or other library standards to support cataloging and classifying of verification data; and – Algorithmic approach to eliminating duplicate matches and identifying or “ranking” the most reliable information (e. g. , identifying that an applicant’s home address is more likely to be accurate than an address at the non-profit or clinic where applicant applied for benefits). 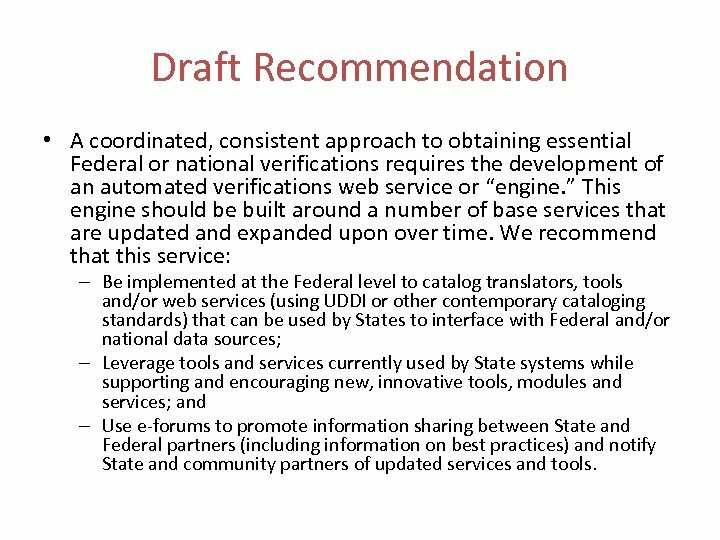 Draft Recommendation • A coordinated, consistent approach to obtaining essential Federal or national verifications requires the development of an automated verifications web service or “engine. 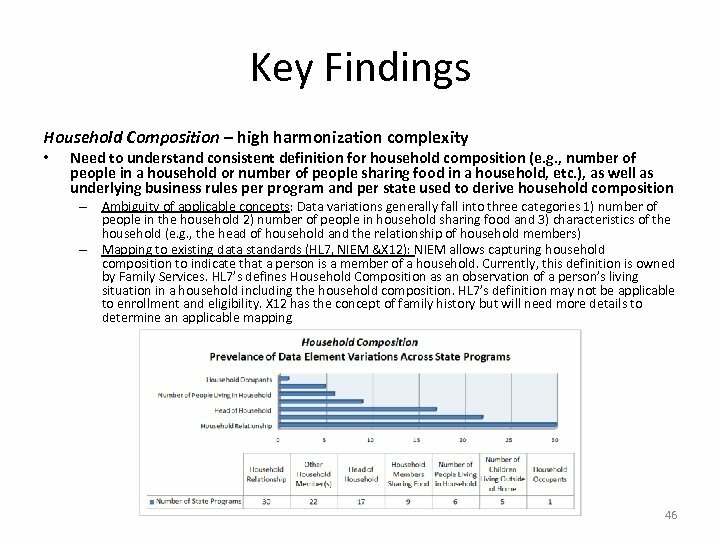 ” This engine should be built around a number of base services that are updated and expanded upon over time. 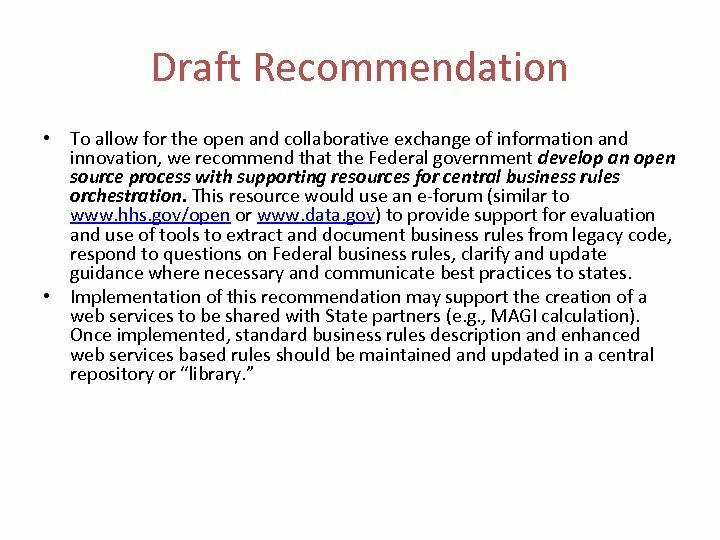 We recommend that this service: – Be implemented at the Federal level to catalog translators, tools and/or web services (using UDDI or other contemporary cataloging standards) that can be used by States to interface with Federal and/or national data sources; – Leverage tools and services currently used by State systems while supporting and encouraging new, innovative tools, modules and services; and – Use e-forums to promote information sharing between State and Federal partners (including information on best practices) and notify State and community partners of updated services and tools. 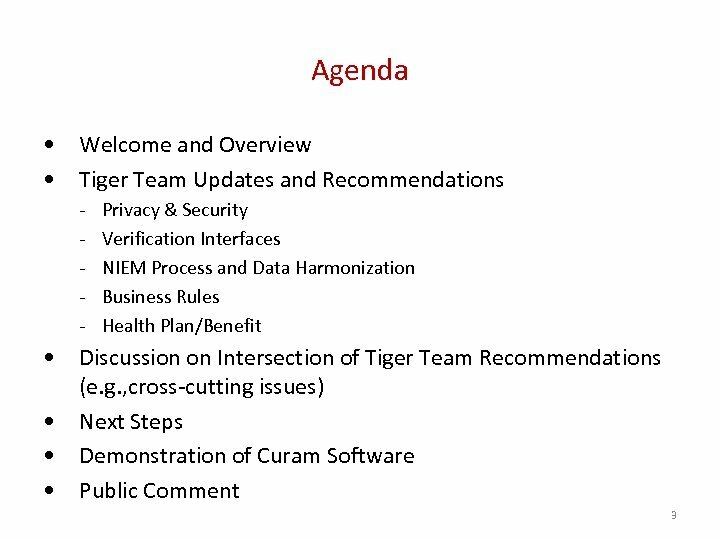 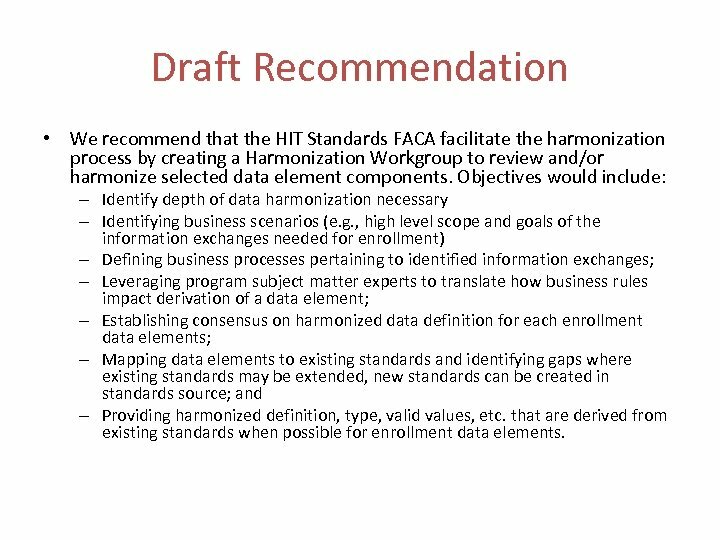 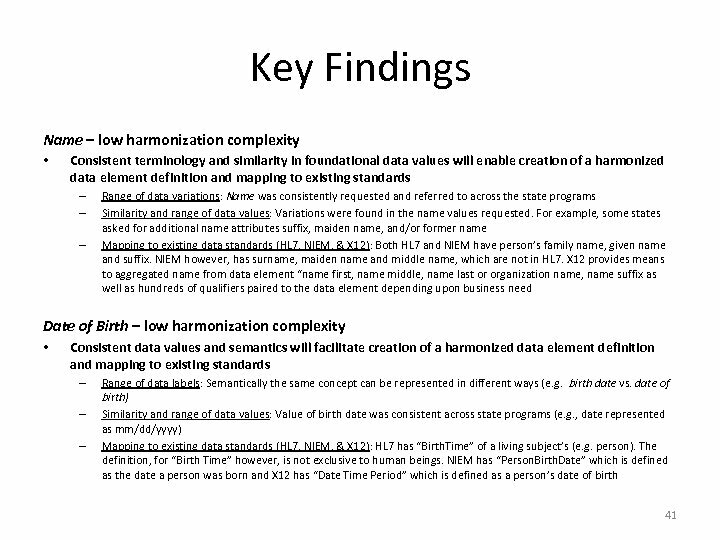 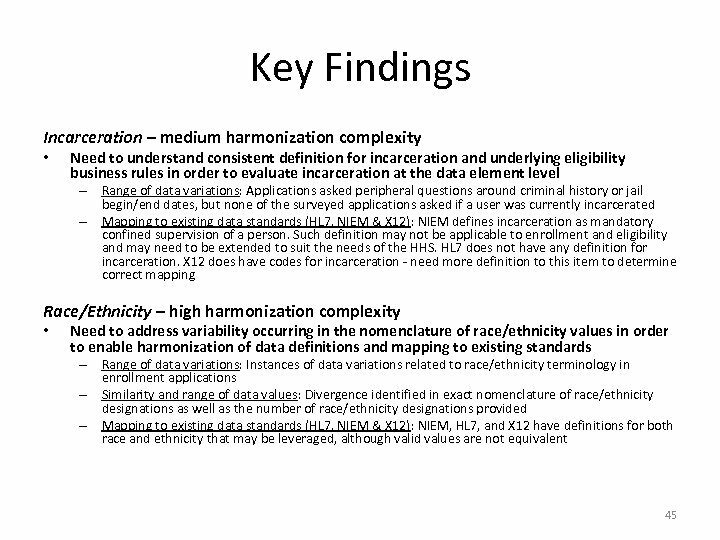 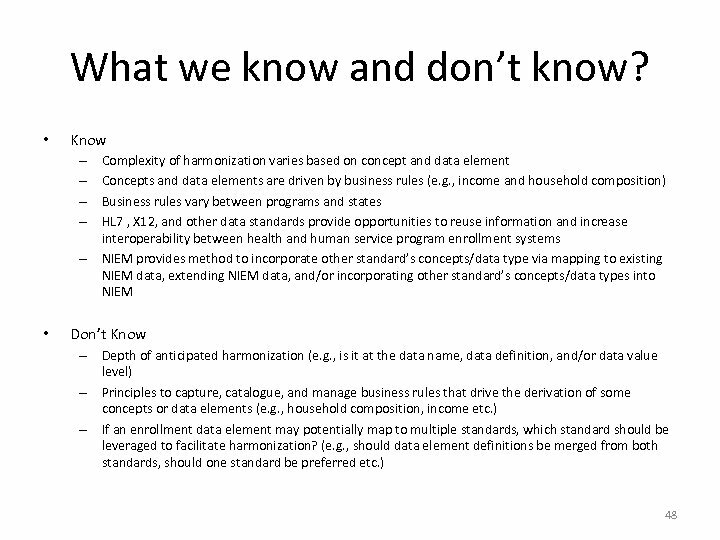 Draft Recommendation • We recommend that the HIT Standards FACA facilitate the harmonization process by creating a Harmonization Workgroup to review and/or harmonize selected data element components. 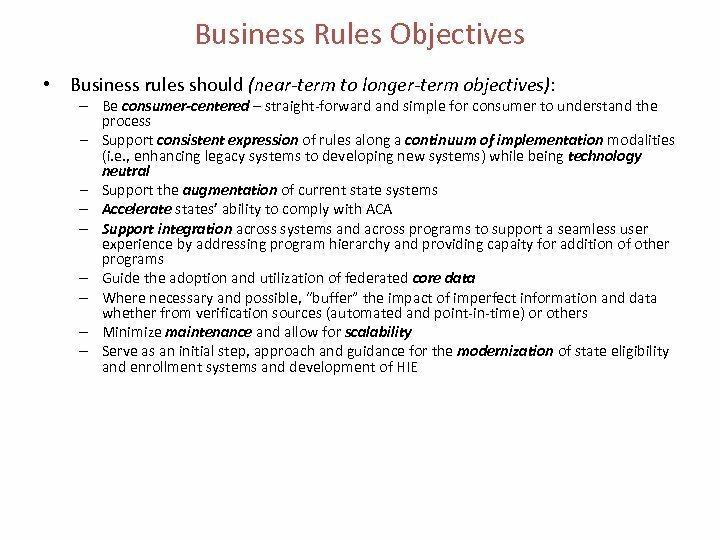 Objectives would include: – Identify depth of data harmonization necessary – Identifying business scenarios (e. g. , high level scope and goals of the information exchanges needed for enrollment) – Defining business processes pertaining to identified information exchanges; – Leveraging program subject matter experts to translate how business rules impact derivation of a data element; – Establishing consensus on harmonized data definition for each enrollment data elements; – Mapping data elements to existing standards and identifying gaps where existing standards may be extended, new standards can be created in standards source; and – Providing harmonized definition, type, valid values, etc. 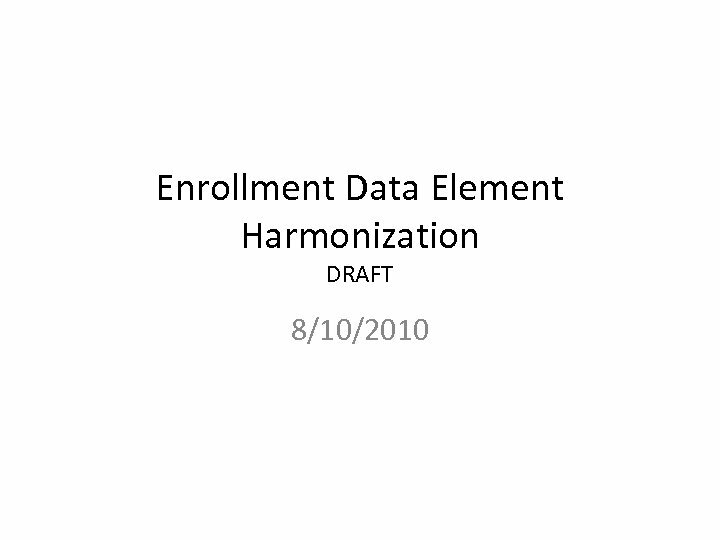 that are derived from existing standards when possible for enrollment data elements. 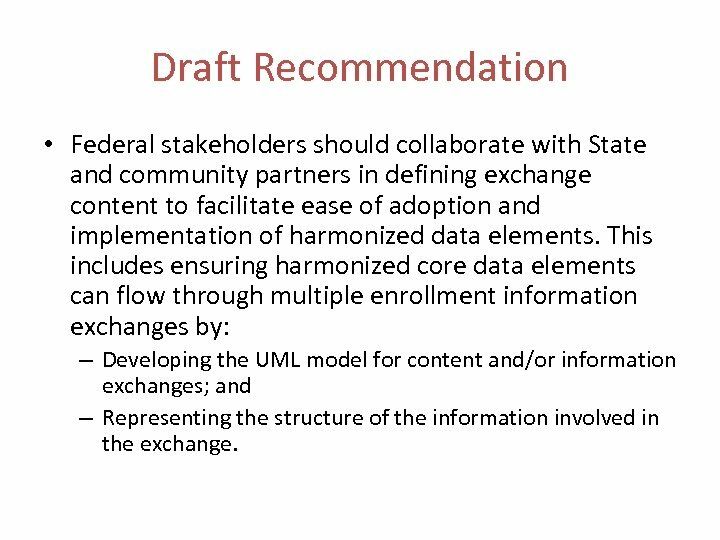 Draft Recommendation • Federal stakeholders should collaborate with State and community partners in defining exchange content to facilitate ease of adoption and implementation of harmonized data elements. 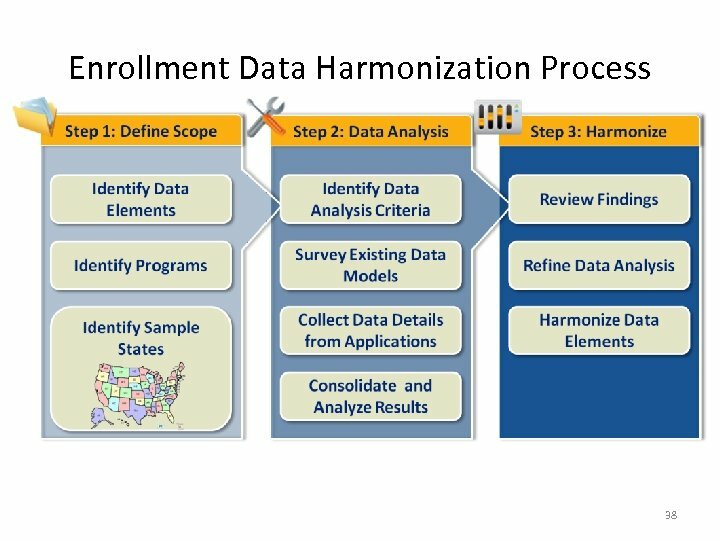 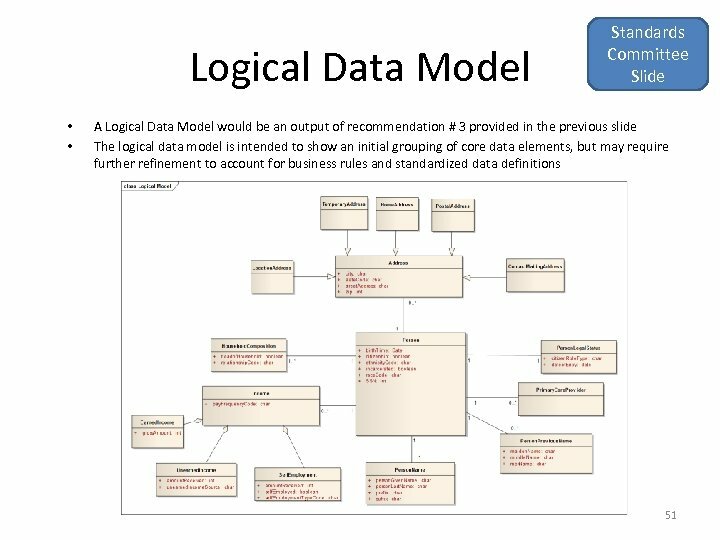 This includes ensuring harmonized core data elements can flow through multiple enrollment information exchanges by: – Developing the UML model for content and/or information exchanges; and – Representing the structure of the information involved in the exchange. 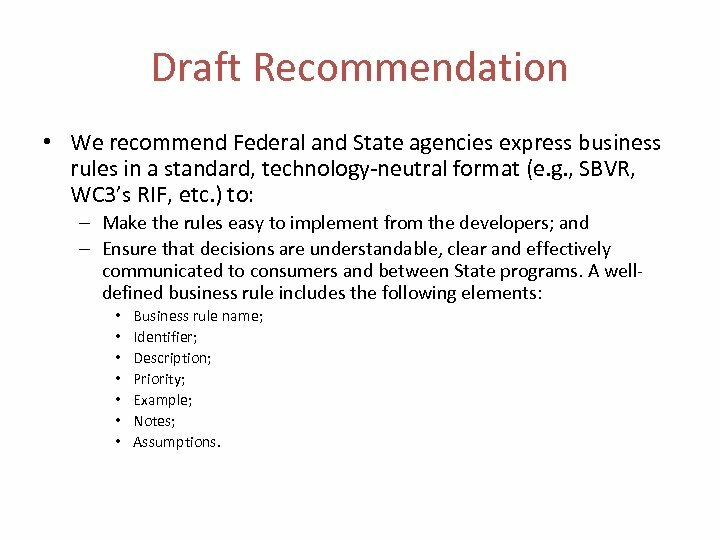 Draft Recommendation • We recommend Federal and State agencies express business rules in a standard, technology-neutral format (e. g. , SBVR, WC 3’s RIF, etc. ) 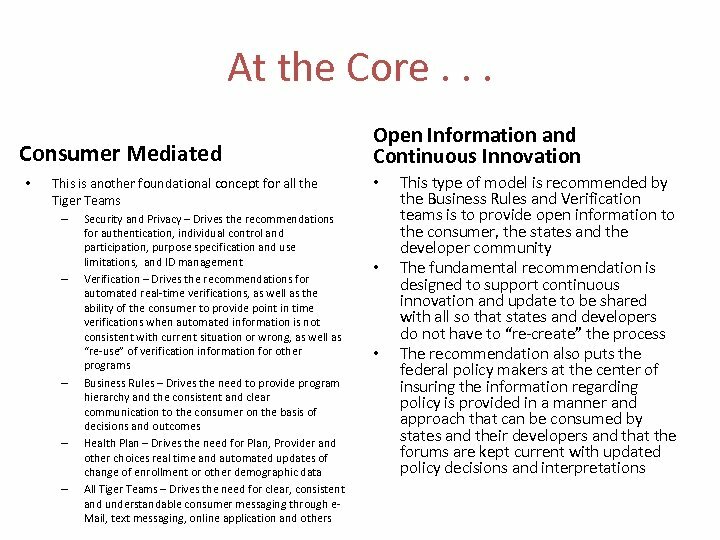 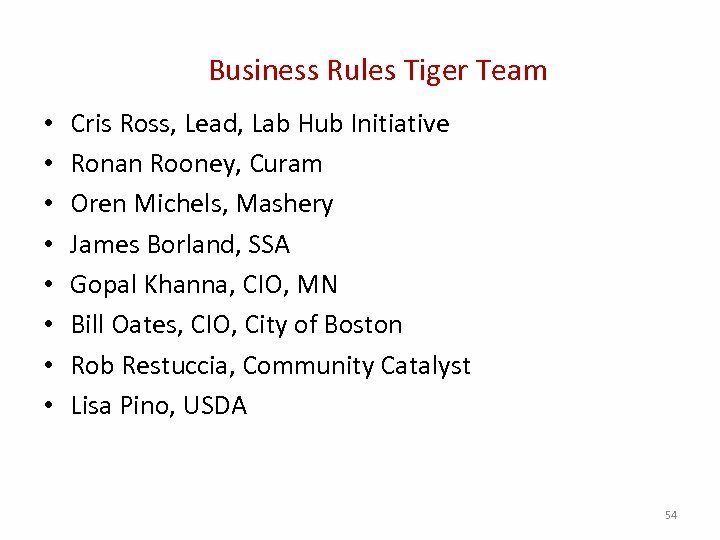 to: – Make the rules easy to implement from the developers; and – Ensure that decisions are understandable, clear and effectively communicated to consumers and between State programs. 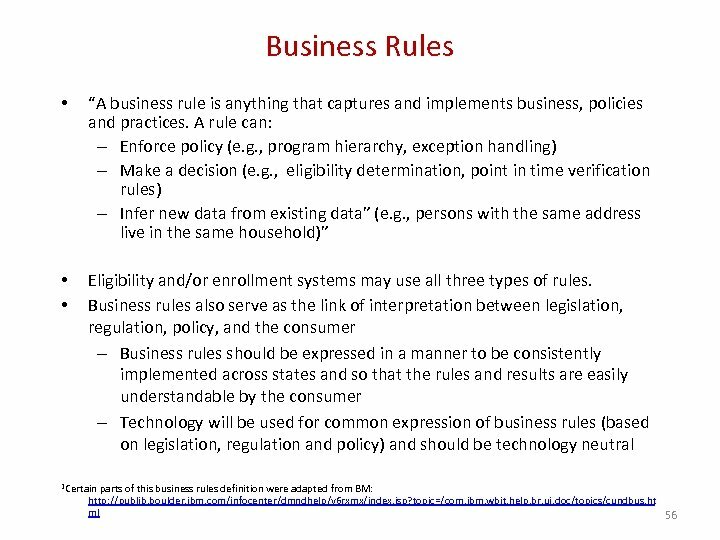 A welldefined business rule includes the following elements: • • Business rule name; Identifier; Description; Priority; Example; Notes; Assumptions. 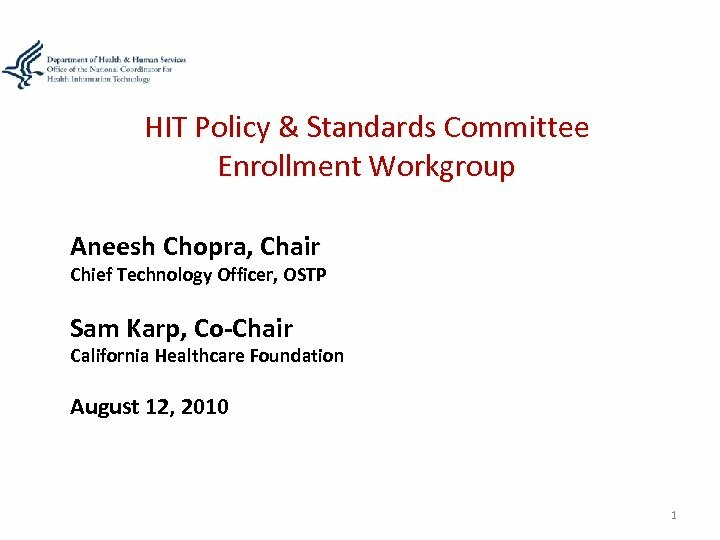 Draft Recommendation • Standards are needed to ensure that the transfer of applicant information between Federal/State programs and health plans is clear, orderly, and rational. 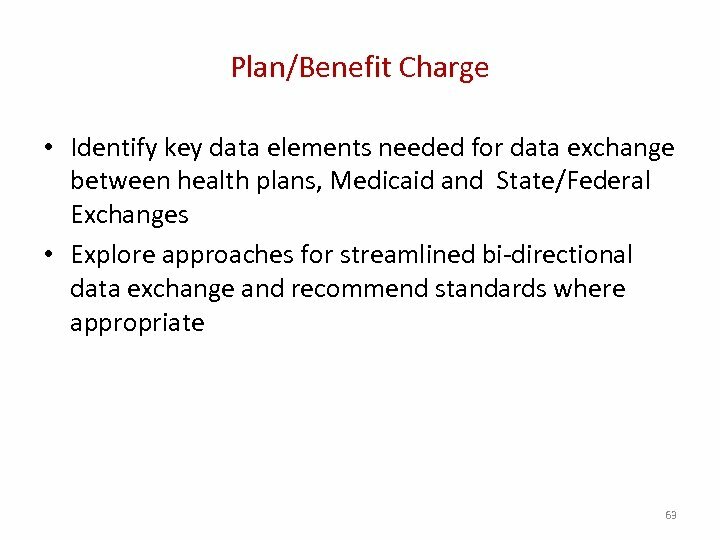 Where possible, we recommend using existing HIPAA standards to facilitate continuity of coverage when an applicant or enrollee is transitioning between health plans. 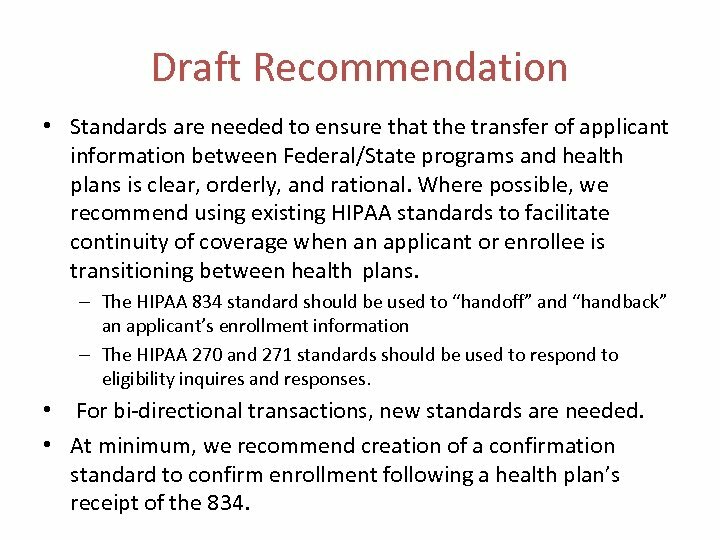 – The HIPAA 834 standard should be used to “handoff” and “handback” an applicant’s enrollment information – The HIPAA 270 and 271 standards should be used to respond to eligibility inquires and responses. 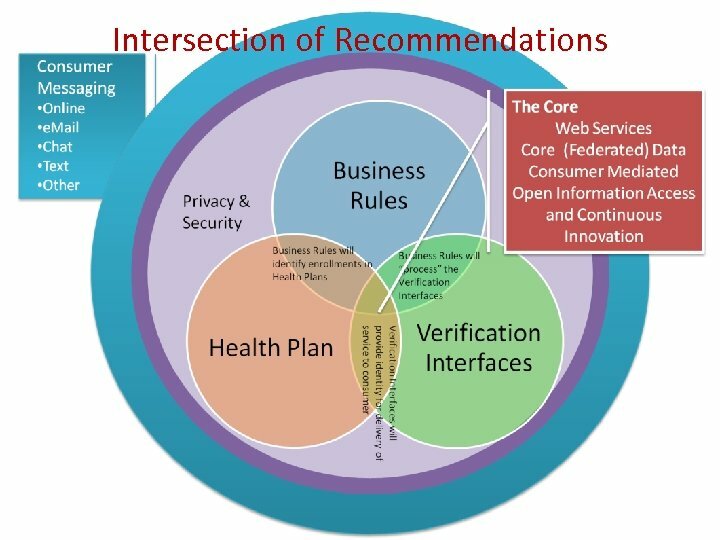 • For bi-directional transactions, new standards are needed. 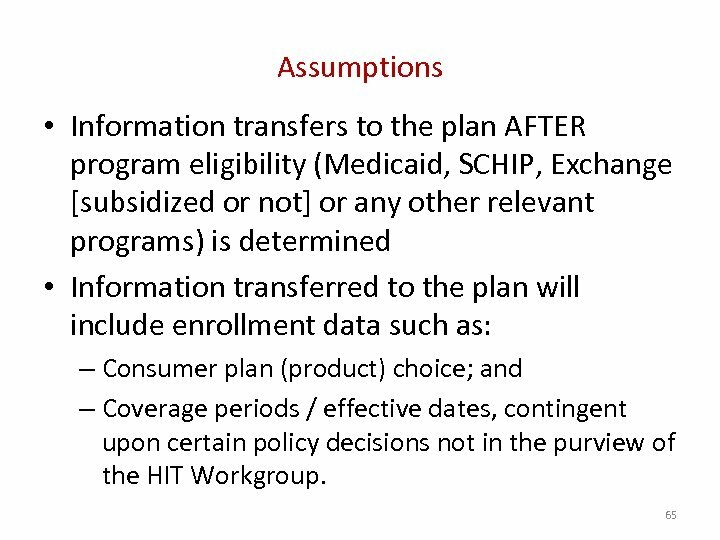 • At minimum, we recommend creation of a confirmation standard to confirm enrollment following a health plan’s receipt of the 834. 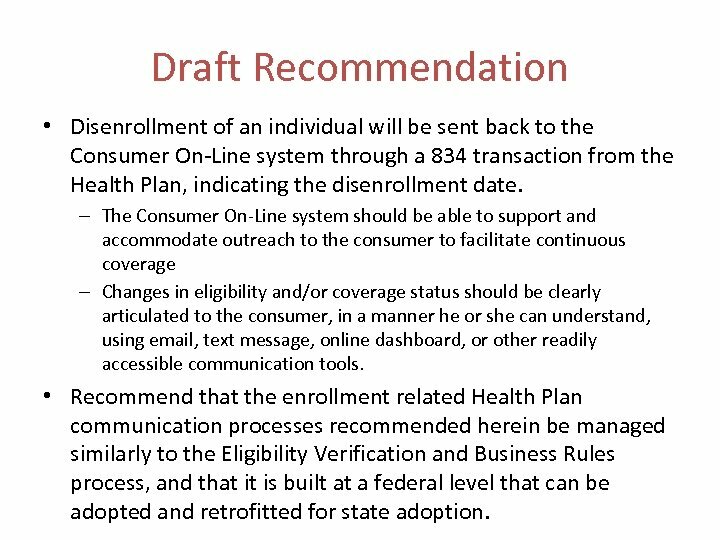 Draft Recommendation • Disenrollment of an individual will be sent back to the Consumer On-Line system through a 834 transaction from the Health Plan, indicating the disenrollment date. 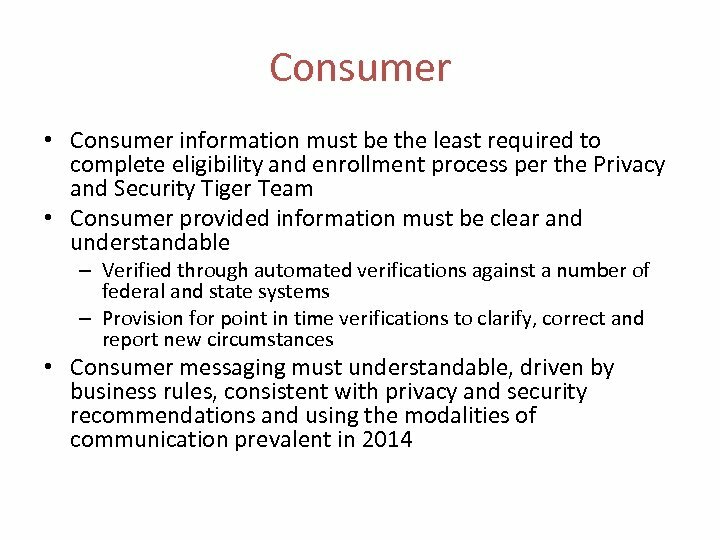 – The Consumer On-Line system should be able to support and accommodate outreach to the consumer to facilitate continuous coverage – Changes in eligibility and/or coverage status should be clearly articulated to the consumer, in a manner he or she can understand, using email, text message, online dashboard, or other readily accessible communication tools. 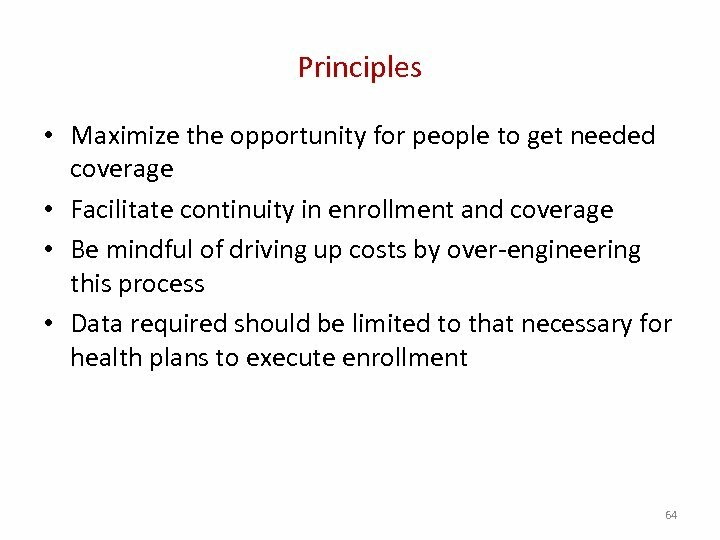 • Recommend that the enrollment related Health Plan communication processes recommended herein be managed similarly to the Eligibility Verification and Business Rules process, and that it is built at a federal level that can be adopted and retrofitted for state adoption. 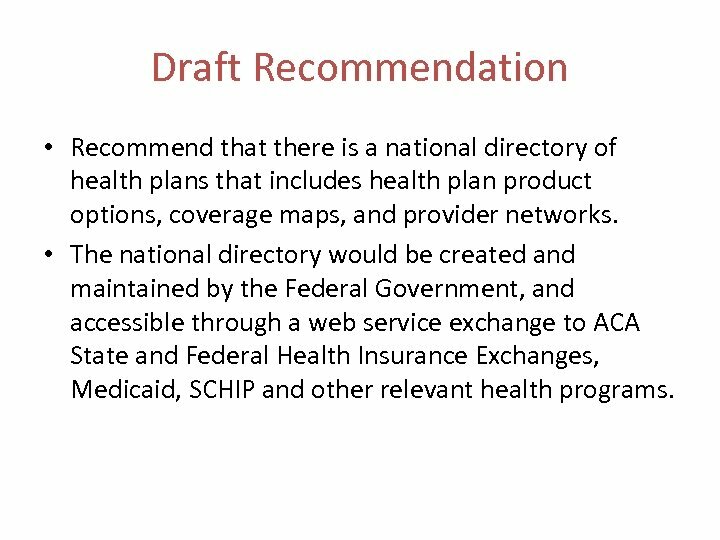 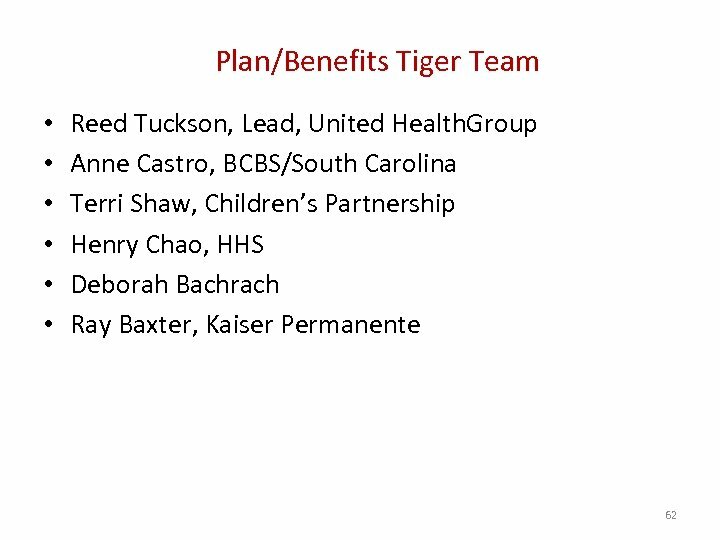 Draft Recommendation • Recommend that there is a national directory of health plans that includes health plan product options, coverage maps, and provider networks. 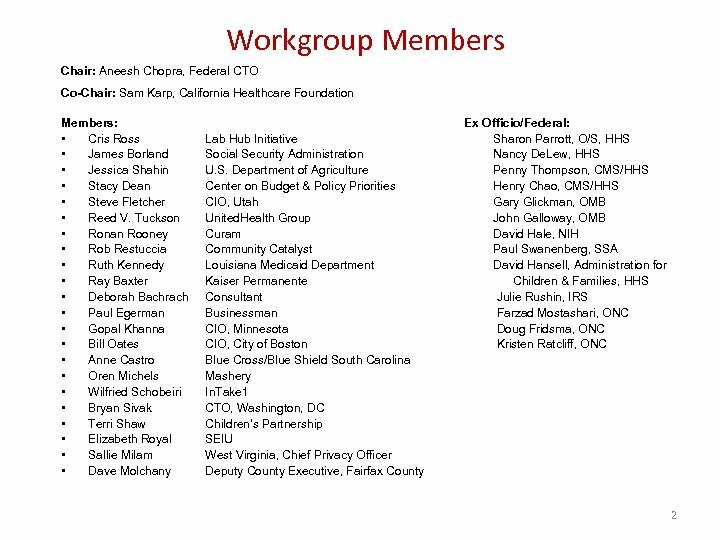 • The national directory would be created and maintained by the Federal Government, and accessible through a web service exchange to ACA State and Federal Health Insurance Exchanges, Medicaid, SCHIP and other relevant health programs. 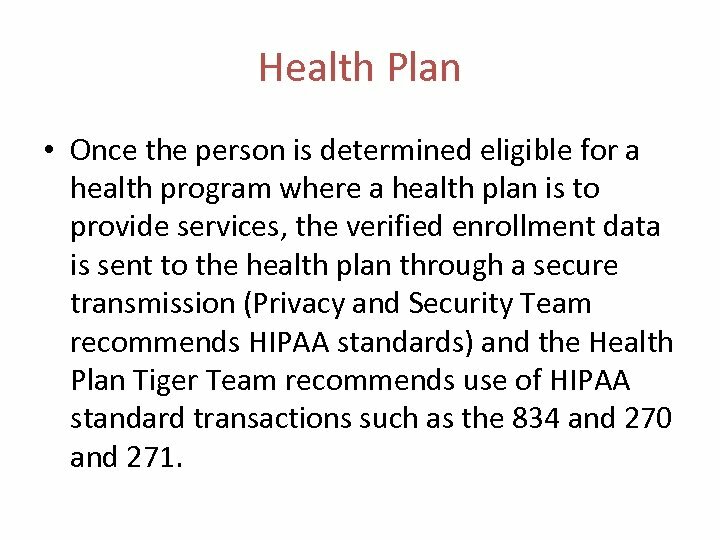 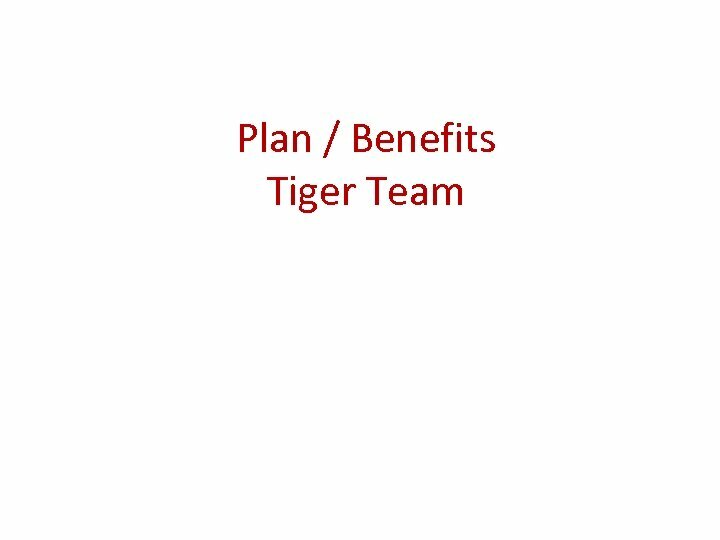 Health Plan • Once the person is determined eligible for a health program where a health plan is to provide services, the verified enrollment data is sent to the health plan through a secure transmission (Privacy and Security Team recommends HIPAA standards) and the Health Plan Tiger Team recommends use of HIPAA standard transactions such as the 834 and 270 and 271.